Edwin (Eddie) Gillett Jr., was born on December 26th, 1948 and died on October 5th, 2011, at the young age of 62. He was the son of Edwin Gillett Sr. and Maryann Westby Gillett, both deseased. His eldest brother, George, to whom he was very close, also died a few years ago. Eddie, who is nicknamed “Pumpkin” by most of his friends, is survived by his wife, Faye Perriott Gillett, and their two sons, Lydell and Lowell. He is also survived by his older brother, Donald, and youngest brother, Stephen “ Stebo” Gillett, and his four sisters, Burma Flowers, Gwendolyn Tillett, Elestine Gillett and Jennifer Wilkerson, as well as a number of nieces and nephews. Eddie was born in Crooked Tree Village and attended the Crooked Tree Government School. He joined the Belize Police Force on May 1st, 1970 and graduated from the Police Training School on November 1st that same year, with a marksman badge for shooting on the rifle range. He reported for Beat Duty at the Central Police Station in Belize City. He was well liked and admired in the Police Force. 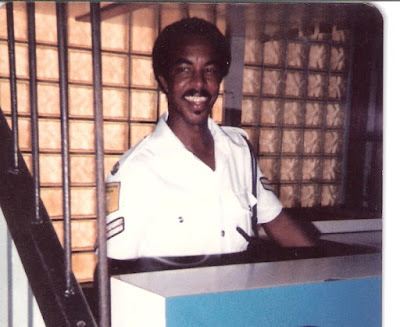 During a transitional period bent 0n improving the immigration image at the airport, he was assigned posts at the Police Headquarters and Quarter Master Departments in Belize City. Eddie came through as usual, and eventually worked his way up through the ranks to become the Chief Immigration Officer of Belize. He retired a few years ago and built a home in Crooked Tree Village where he and his family spent quality time among relatives and friends. 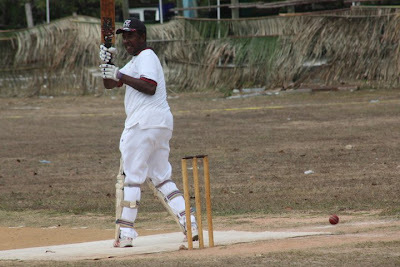 Eddie was also an outstanding sportsman, playing on the Police Cricket Team. 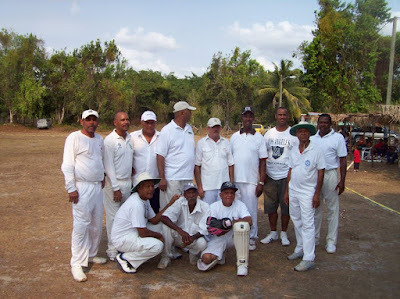 He was the open pace bowler and a fairly good batsman as well. He even played cricket last Easter Sunday in an over fifty match-up game against the visiting Goldies Team from Los Angeles and did very well. He also enjoyed playing a game of domino, joking and clowning around with his friends in his usual happy-go-lucky ways, always with a bright smile on his face. 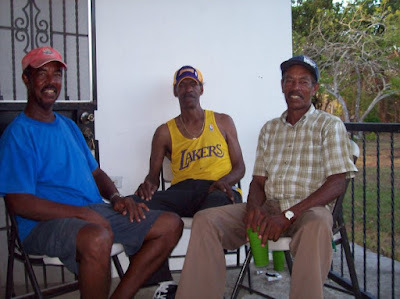 His favorite partner, Gilroy Nicholson, had just returned from vacationing in Belize, when Eddie arrived last week in Los Angeles to visit his brother, Steven. Gilroy who lived and worked for many years in Los Angeles was showing him around for the past few days. They were scheduled to go on another outing the day he died, but cancelled due to the heavy rain. L.A.P.D. Officer, Sheldon Nicholson, had a special dinner at his home for him on Saturday, October 1, and plans were for all of his colleagues and cricket buddies from Belize to meet and dine with him in Los Angeles. 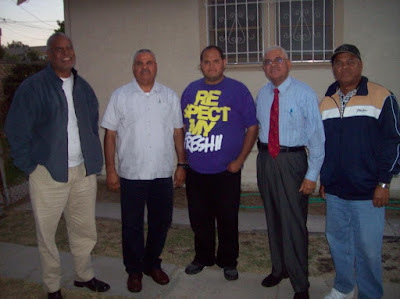 Last Easter at Eddie's home in Crooked Tree Village; brothers (C) Steven and (R) Donald. His body will be flown to Belize tomorrow, October 14 and a wake will be held in his beloved Crooked Tree Village on Saturday night. Funeral services will be at the Crooked Tree Nazarene Church at 10:00 a. m. on Sunday, October 16, 2011. The Rev. Archibald Gillett will preside over his home-going service. Edwin was well liked and will be sadly missed by all his family and friends. We express our sincere condolences to his entire family. It is sad to see a happy go lucky person as Eddie leaving. I will always remember him as a very helpful and friendly person. He was always ready to help his people when they would need some kind of assistance in whatever job he was holding at the time. I am very sadden by the death of Eddie who I knew and admired for many years. A very humble and upright man, who was pleasant to all. My deepest sympathies go out to his wife, children and extended family. Condolences to his family. I remember Eddie from the days when he was head of immigration at the airport - BIA then. He was always friendly and was well liked. RIP Eddie. The officers and members of the United Garifuna Association Inc., Belizean American Caribbean Football Association Inc. and the Belize Exservicemen League all from the city of New York, would like to take this opportunity to extend our sympathy to the family of a beloved husband, brother, relative and friend Eddie Gillette who died recently in Los Angeles California. 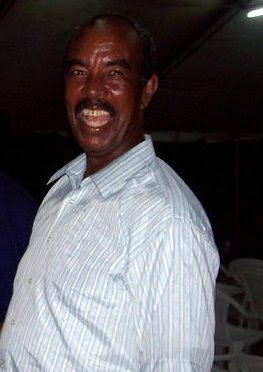 He was a very good friend of my brother Henry Errol Noralez who also died on the 14th of February Valentine's Day in Houston Texas and was buried on March the 12th, 2011 in his home town of Dangriga. I remember serving the same time when P.C. 29 Gillette was attached to Prosecution Branch. I have never seen Eddie angry in all the years I knew him. He will be sadly missed by all of us who had the time to be arround him with his evarlasting smile. Eddie, please prepare for us until we get to meet you one day. I am very sadden by the death of Eddie who I knew and respected for many years. He was a very humble and upright man, who was pleasant to all. My deepest sympathies go out to his wife, children and extended family. I am there with you in spirit I can figure out the timing and I know when the final part of this process presents itself will be the hardest TIME. TIME is the great HEALER and focus on the good times. I recall our Domino experience in Crooked Tree. LOVE you ALL, Hugs and Kisses from Ernestine's House.